Georgette ready-to-wear Indian saree in an elegant beige color. 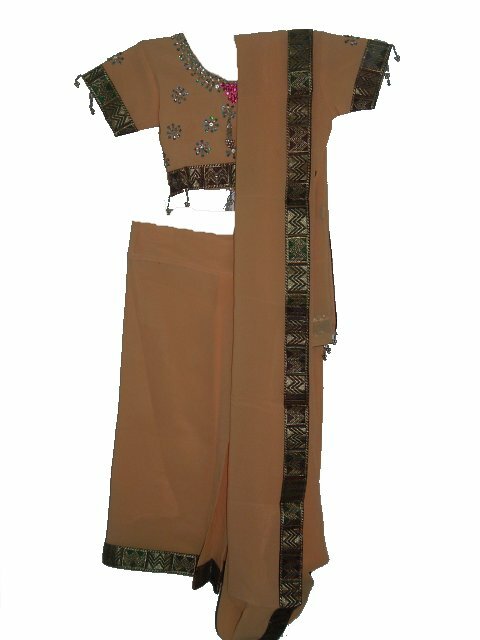 The readymade saree set consists of a blouse, petticoat and saree. The saree is attached to the petticoat, and the pleats are pre-made. All you need to do to wear this saree is to slip it on like a skirt, and then arrange the "pallu" the way you want to; a saree in minutes!! The saree is embellished with bead & sequin bootis all over the pallu, and has a green & silver border along the entire length. The blouse has delicate bead work too. The blouse has an inner fabric lining, and is short - it leaves the midriff exposed; it has hooks in the back and can be opened up fully to put on. The skirt part of the saree has a drawstring waistband. Sizes available for kids aged seven and up.